Identification of causal variants in hereditary diseases can be both challenging and time consuming. Often a lot of time and resources are wasted on identifying a disease causing variant from a TRIO and trying to validate variants, which are actually not disease causing or artifacts. Furthermore, sometimes no causal variant can be identified at all in the patient. Our hereditary disease solution delivers increased sensitivity for identifying causal variants, while reducing significantly the list of candidate variants for follow-up. In addition, it is very easy to run as data analysis and interpretation steps are embedded in a streamlined end-to-end workflow with optimized parameter settings. In this poster we show the first results from a benchmarking study with six whole genome trios and one whole exome trio. If you are looking for the causal variant in a family with a hereditary disease, it is important that you trust the quality of your analysis and interpretation pipeline. Our solution enables rapid discovery of candidate variants from trios, single samples, parent and child, or extended families — while making sure you’re not investing your time and resources in pursuing variants that are not real. Ingenuity Variant Analysis was used to analyze whole genome data generated from family trios centered on probands, with rare, syndromic diseases, with no known clinical diagnosis and negative results for standard genetic testing. The software classifies variants using ACMG assessment guidelines using the pre-curated QIAGEN Knowledge Base of biomedical literature and clinical evidence that allows standardized and scaled annotation, filtering, classification and reporting of observed clinically relevant variants. 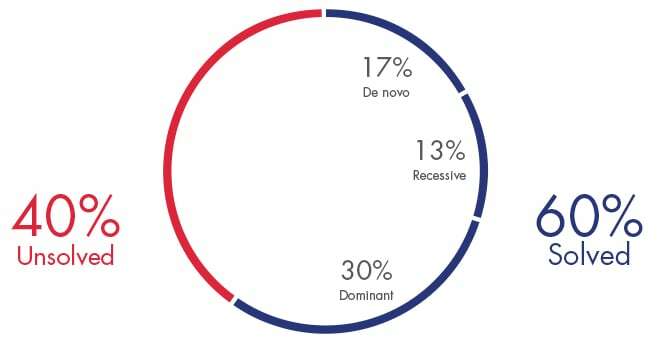 A causal variant was successfully identified in 60% of the cases (figure 1). Half of the solved cases carried a heterozygous variant, in autosomal dominant genes underlying known Mendelian diseases, that was transmitted by one of the parents. Recessive or de novo inheritance models accounted for 20% and 30% of all solved cases, respectively. In cases with an inherited, autosomal dominant disorder, filtering to keep rare, pathogenic, and transmitted heterozygous variants in the proband(s), yields over 300 variants. This number can be reduced to ~150-200 in cases where the carrier (or affected) parent is known. However, when biological context filtering using the Ingenuity Knowledge Base was applied, this number was reduced to 25 or less, in 96% of the solved cases. Overall, the number of candidate variants was reduced to 5 or less variants in 84% of all solved cases. 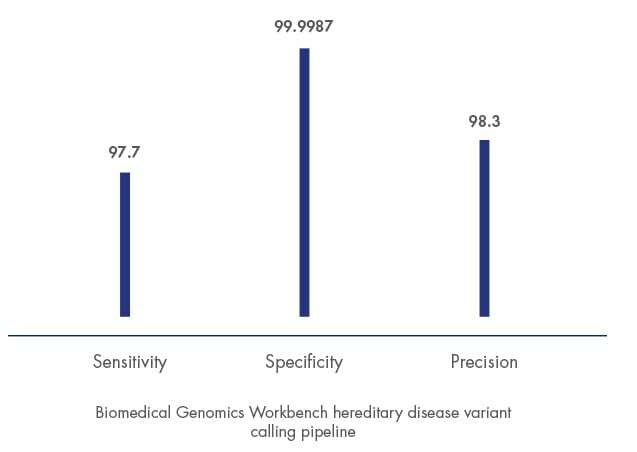 The Biomedical Genomics Workbench variant calling pipeline has demonstrated high sensitivity, specificity, and precision. It was tested on the gold standard variant set from Genome in a Bottle and exome sequencing data (150x coverage) provided by the GCAT portal and achieved excellent results (figure 2). Figure 2: Sensitivity, specificity, and precision for calling variants using the gold standard variant set from Genome in a Bottle and the 150x dataset from the GCAT portal. These results were reproduced by performing an indirect comparison using the GCAT portal. In addition, our false positive rate was found to be four times lower than open source tools like SamTools (figure 3). In some cases the disease-causing variant is not a SNP or small indel, but a very large deletion or duplication within the genome. Our copy number variant (CNV) detection works equally well on targeted amplicon sequencing data (PCR-based target-enrichment) as well as on whole exome sequencing data (hybridization-based enrichment). In test results from published targeted amplicon sequencing data, Biomedical Genomics Workbench identified all causal CNVs of different sizes with a very low overall false positive rate of 0.014 and a specificity of 98.42% on average. Likewise, the CNV detection tool achieved high sensitivity of 97.56% on a published whole exome dataset from the open source tool EXCAVATOR. True variants in this dataset are those confirmed by a SNP array. Table 1: Results from running the Biomedical Genomics Workbench CNV detection tool on deep sequencing data from hereditary disease samples after PCR-based target enrichment. Figure 4: Sensitivity measured on the published dataset of EXCAVATOR. Download the whitepaper demonstrating the accuracy of CNV detection compared to state-of-the-art methods. 1. Reinecke F. et al., Quantitative analysis of differences in copy numbers using read depth obtained from PCR-enriched samples and controls. BMC Bioinformatics. 2015, 16:17. 2. Magi A et al., EXCAVATOR: detecting copy number variants from whole-exome sequencing data., Genome Biol. 2013, 14(10):R120.